Uh oh red exclamation mark. Ever get that red exclamation mark in your ArcMap Table of Contents? No worries, this is probably because you were moving the file from your C drive to your D drive. Or sharing your ArcMap file on a memory stick. Or you shared the ArcMap file, but not the GIS files. The red exclamation marks represents a broken pathway. To help you, I’ve uploaded a video called Fix the red exclamation mark using relative path directories. To fix this problem, simply select the check box next to your dataset and set the Data Source. But this is only a temporary fix. A more permanent fix is to set your Relative Path Directories. A relative path would be formatted like this: teachugisbikeway.shp. Relative path identify the file location without associating drive names. So long as you use similar file structures (i.e. place your *.mxd file with associated *.shp files in one folder), you’ll find this will fix your red exclamation mark problem. 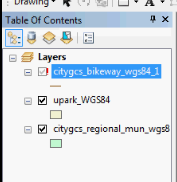 Note, that the ArcMap 10 version access to the Relative Path check box is slightly different from ArcMap 9.3. If you need instruction, feel free to contact me.